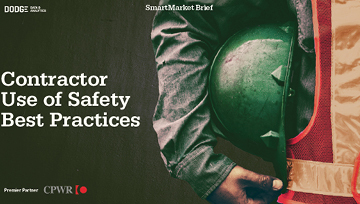 This SmartMarket Brief provides new research on best practices for improving safety in construction, and offers insights into how the industry can improve its approach to safety. The findings reveal how basic best practices for noise reduction, injury reduction and material procurement and handling are widely known, but are not yet standard practices in the industry. The Brief also demonstrates that most contractors do not utilize many of the online resources available to improve safety in these areas, despite the high degree of value reported by those who use them. Research on other strategies, such as mentoring of subcontractors, leadership training for supervisors and foremen, and the use of Lean construction practices, also provides insights into their impact on safety and their use in the industry.